Desk Clocks Section welcomes sellers and buyers from worldwide! Sell and buy clocks and watches on Export Portal - discover shopping without borders! It is quite useful to have a desk clock or a table clock in your office or home, as it can help you monitor how much time you have spent on a task. On Export Portal, sell and buy all kinds of office desk clocks, home table clocks, decorative desk and table clocks. Browse our large assortment of desk clocks of all styles, shapes and materials. Select contemporary, retro, vintage or modern desk clocks. 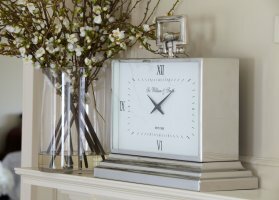 Choose table clocks made from various materials such as crystal, glass, metal, plastic and wood. Shop for rectangle, round and square desk clocks with additional options like alarm, date indicator, temperature and humidity reading. Export Portal is where you find the best product ideas and the most profitable deals! Sell desk clocks like an expert! Expand your business by trading with the biggest exporters and importers from worldwide! Discover accessible prices!